I don't know about you, but I'm all about 70s decor style coming back. As the old adage goes, everything old is new again, and that is certainly true for retro inspired wall hangings. I've always been wild about hanging textiles, perhaps it's because they remind me of beautiful vintage rugs I would see hanging in houses all over Poland when I was a kid. They can bring so much texture and color to any space, and with a myriad of different styles and color combinations to choose from, chances are you won't make a mistake. Since wall hangings are taking over the world by storm (ok more so the instagram design world), I thought that I would share a few of my favorites. Based out of Brooklyn, this company makes jewelry, rugs, bags, and other cool stuff. I think I discovered them years ago through the Brick House, and I've been hooked ever since. Below is Blackwater Country, a wall hanging they currently have on sale for $500. I love the contrast between the soft pale silk and navy shag wool, a total winner in my books. I will forever be kicking myself for not buying this when I spotted it on sale at a shop in Palm Springs last year. BIG MISTAKE. It's no longer in stock, and don't expect it to make a comeback. The blush with the neon green, a touch of blue...it's so fresh, alive and playful. If I had to sum up my personality in a wall hanging, this would probably be it. Mimi Jung is a more recent find, but she's definitely in the running to become one of my favorites. Her woven textile designs are modern and light, yet they make such a powerful statements and feel much more like paintings rather than textile art. Her work is smart and sophisticated, and I can see her pieces hanging in a museum or in a gorgeous modern home or loft. You can purchase them straight off of her website. Now you can't really talk about wall hangings without mentioning Maryanne Moodie. I've been following her work on Instagram for a while, and she makes some incredible pieces. 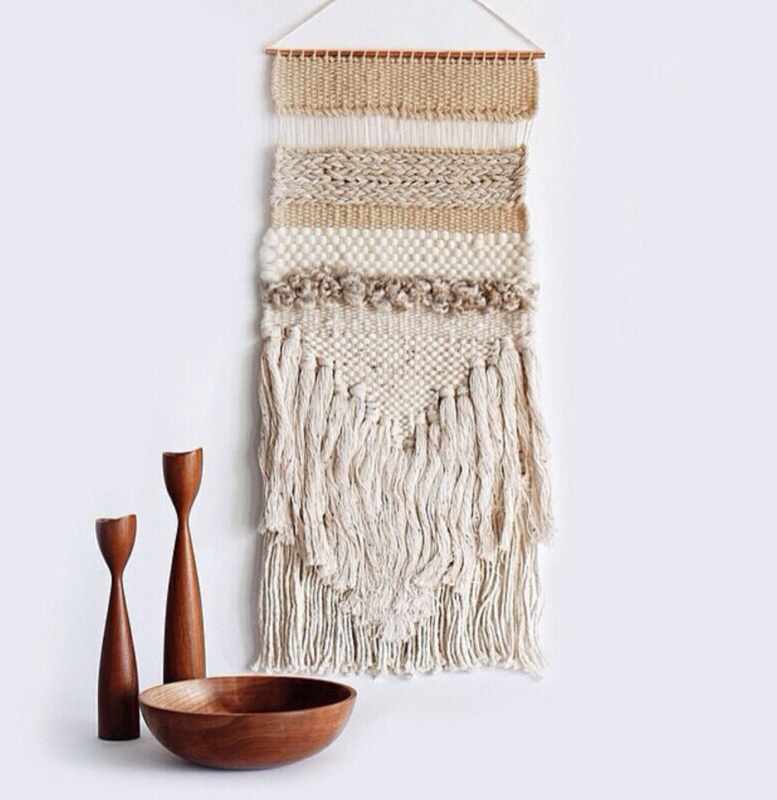 Also based out of Brooklyn, she not only creates wall hangings but also teaches the craft worldwide. I wish I could summarize her work, but since every piece she makes is so incredibly different, you never know what you are going to get, and I like that she keeps things interesting. She does calm, muted shades just as well as bold, colorful, punchy tones. Follow her on Instagram and Etsy to see more of her work or create a custom piece for your own home. Native Line is run by artist Justine Ashbee, who combines geometric lines with precious metals to create spectacular shimmering pieces of wall art. Her use of gold and silver makes her work feel truly one of a kind. Her work is inspired by Southwest desert landscapes, where she spent several months, dreaming up her designs. You can find her designs at specialty stores worldwide as well as through her online shop.